Another UFO shot down without malice. 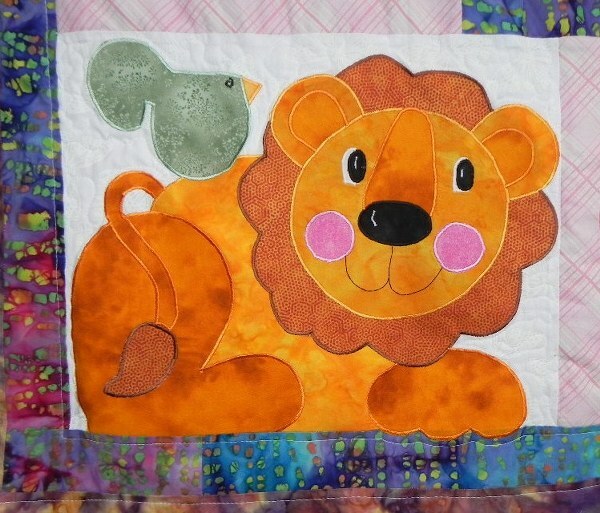 In fact I quite enjoyed quilting this one. When finished I washed it and dried it in the dryer to see the effect. 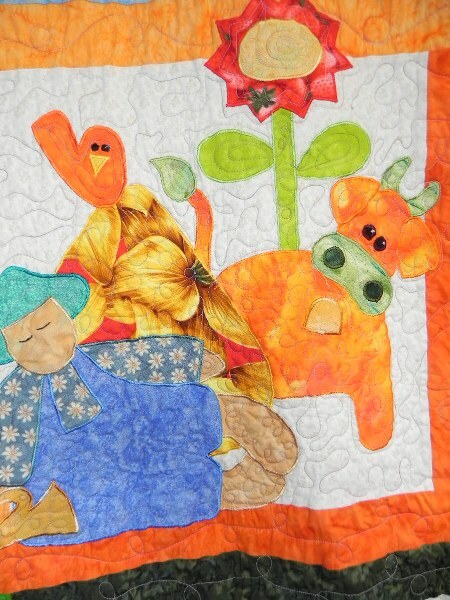 I have always shied away from washing quilts when finished but that was mainly when I did stitch in the ditch. 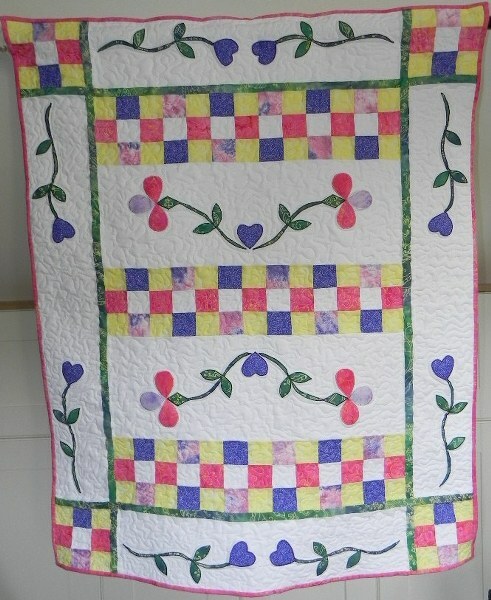 With the amount of quilting on this one it just gets what is known as the ‘antique’ look. Putting it in the dryer enhances the look. Mind you if you have just spent hours and money on a future heirloom don’t take my word for it. I have a whole stack of pieced tops on which to experiment. The worst that can happen is that I use it to keep myself warm in the depths of Winter. I would hate to be responsible for a recherché bed for the dog. 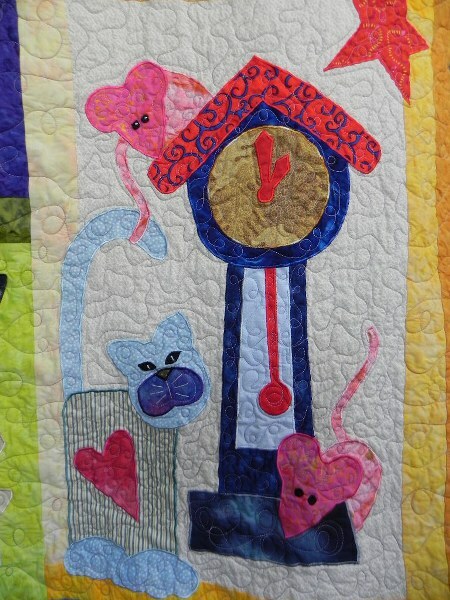 The only snag is that a pile of UFOs takes up less room than a pile of finished quilts. ‘Some people are never satisfied’ I hear you say. This is another Kookaburra Cottage pattern, originally pubished as a BOM. The unquilted version and another colourway are in my post ‘Where’s Goosey Gander When You Want Him’ if you are interested. 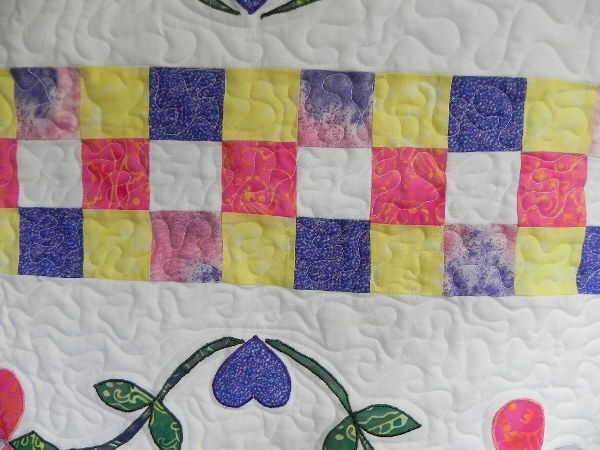 As I have said before, the quilting adds that little extra something in the same way as the backstitch on a cross stitch picture. 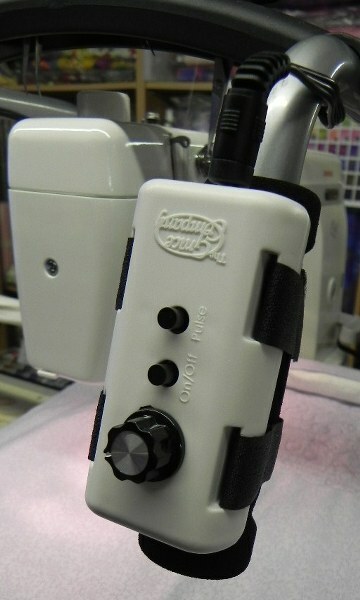 Now that one is finished I am having a go at using a speed controller instead of the stitch regulator. Initial tests are promising although it would be a bit of a downer to find I preferred it to the stitch regulator when it is a seventh of the price. 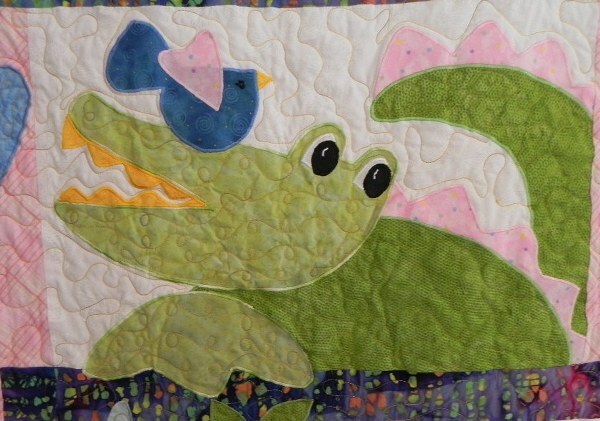 I have started on a quilt I am not too worried about and it seems quite easy to control, especially where ‘caterpillars’ are concerned. Here is the control. Not the prettiest thing ever invented but who cares if it does the job. Yes I do know it’s upside down. I will keep you apprised of the results of the trials. 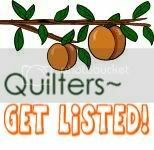 A very good page to visit if you have a frame and midarm is Piecemeal Quilts it has a list of things to check and adjust and a few tips. I found it very useful. 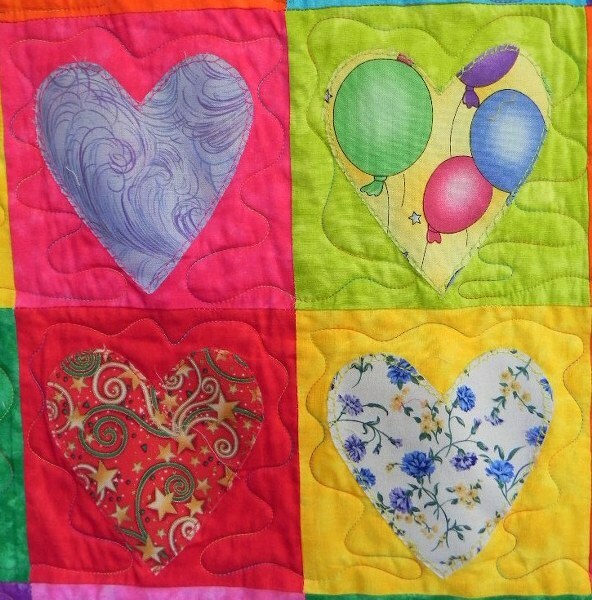 March 30th to April 1st is the Spring Quilt Festival at Westpoint near Exeter. If you are nearby come along. It should be worth it. Aristotle was the guy that said ‘The Whole is greater than the sum of its parts’. Apparently he was right. Who after all, can argue with Aristotle. 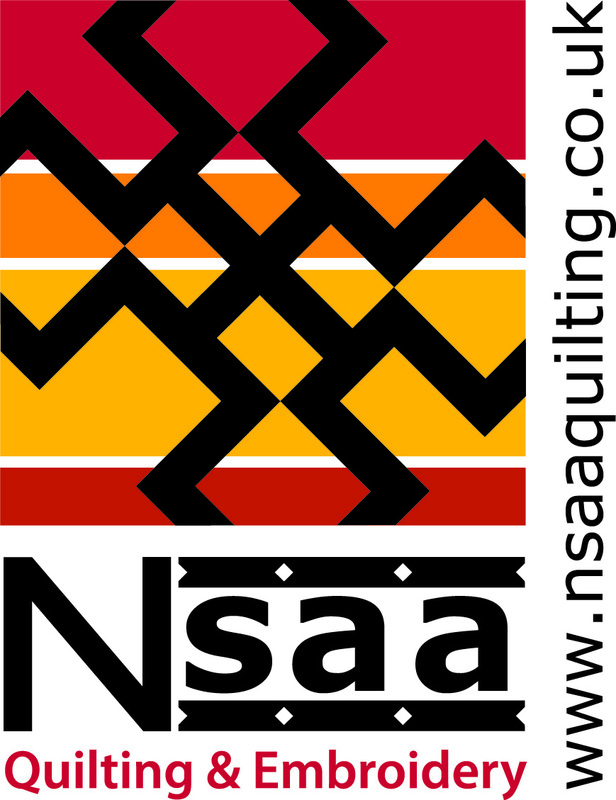 I am afraid I am still on the subject of frame quilting. I am told that nobody looks closely at the cloth of a suit, they look at the overall appearance. If I had only known this when, amongst other things, I made suits I could have saved myself a lot of angst. The same applies to quilting. I have, apparently been expecting too much and nobody will notice anything but the overall pattern. I think the sad fact may be that this is true. Still, we soldier on and I am still working hard at perfecting the art. 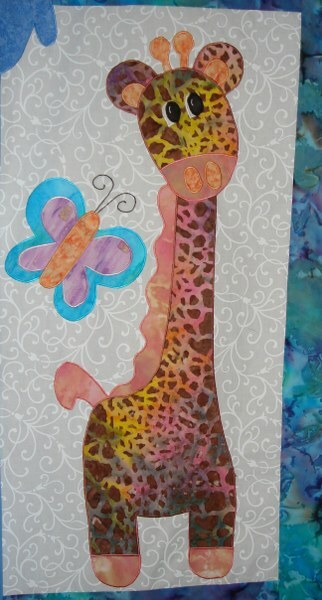 Here is another example I have just finished. 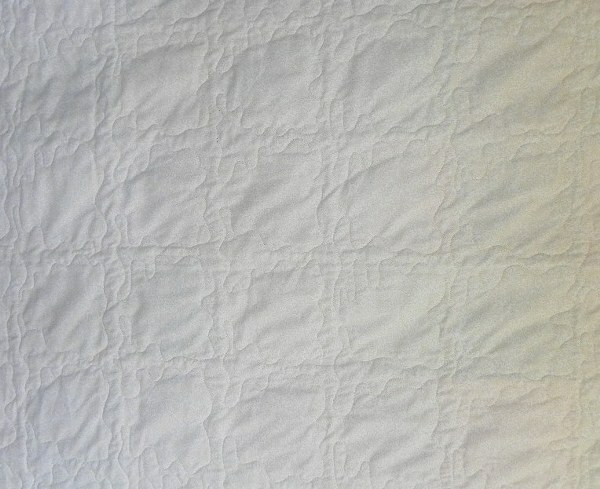 I decided that practising on bits of fabric was all very well but quilt conditions were required for a true test. 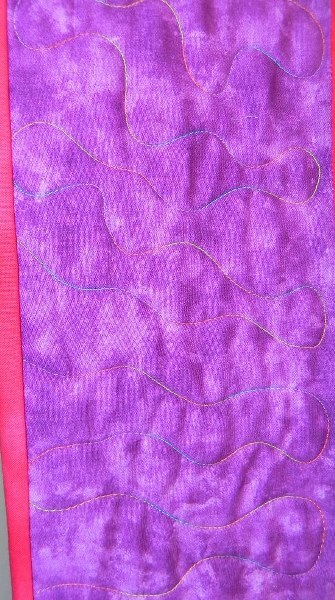 You will notice that I have made myself do the binding too before going on to the next quilt on the frame. After all a UFO is still a UFO until it is completely finished. It is quite a cheery little number. 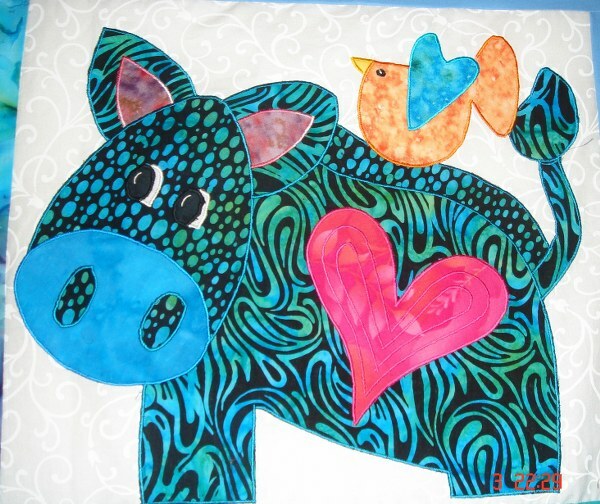 I made it when I was just starting out with applique and I was experimenting. 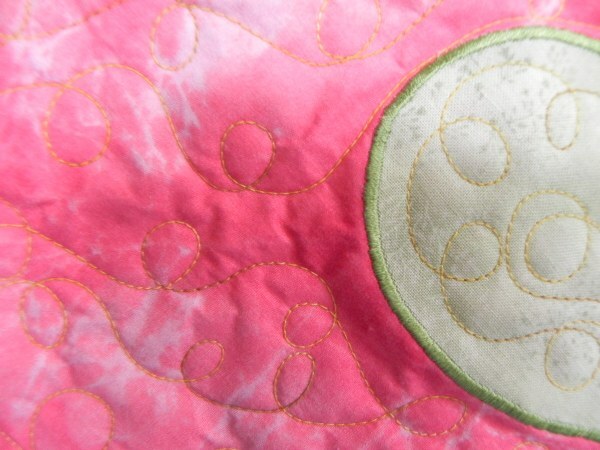 I didn’t know how to set up the tension and which bobbin thread to use for satin stitch so I did raw edge applique. Some people like the fact it frays a bit with wear and washing. I’m not so sure but for what it is worth here it is. 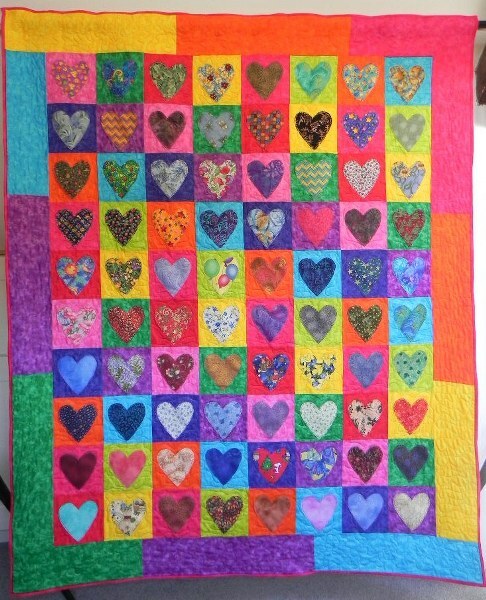 I had a bit of an obsession with hearts as they were a good way to use up charm squares. 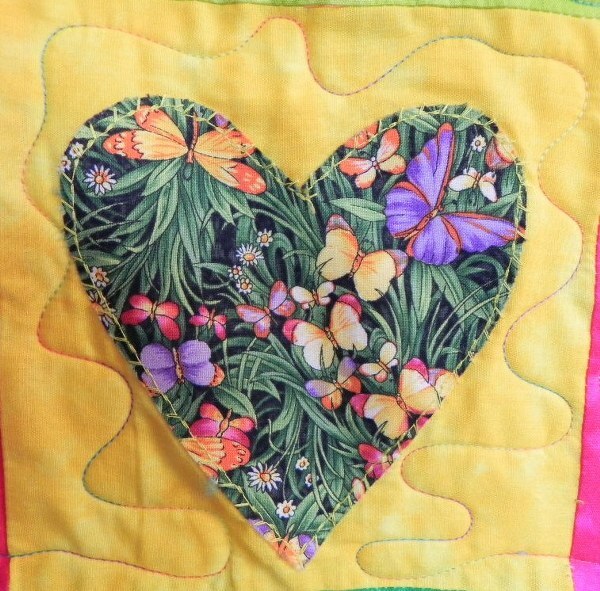 Now I use the charm squares more for general applique but the hearts are still great fun. Here are a few closeups. First the raw edge applique. 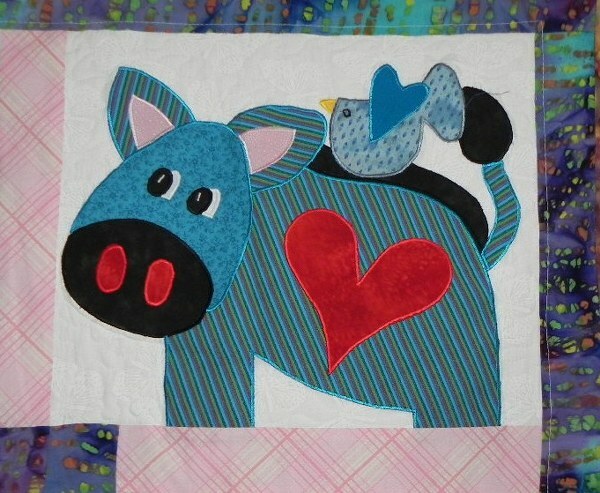 Now the not so perfect ,but still being persevered with, quilting. Don’t you just love variegated thread on vibrant colours. The back looks really good on the Aristotle principle too. Recognise this old friend? Unpicked and requilted – definitely worth the effort. 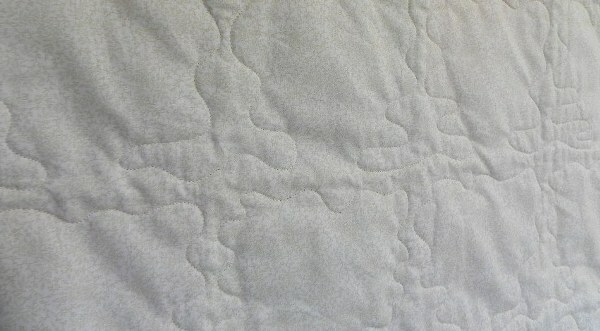 I also gave it a wash to redistribute the fabric and lose the holes from the original quilting. I have always avoided washing a finished quilt but with this amount of quilting the ‘antique look adds to the overall effect. We are getting there although there are still a few ‘deliberate’ mistakes. I believe you are supposed to have a few mistakes as nobody is perfect but (here insert the name of your particular deity). I’m not so sure. I must remember that irony is something not everyone understands. It doesn’t always travel the length of Britain so I guess I should have known it wouldn’t translate so well round The World. What you have to remember when reading my posts is that my way of getting through life involves a deal of self denegration and a modicum of self mockery. Probably something to do with placating fate but then let’s not get too deeply into that. 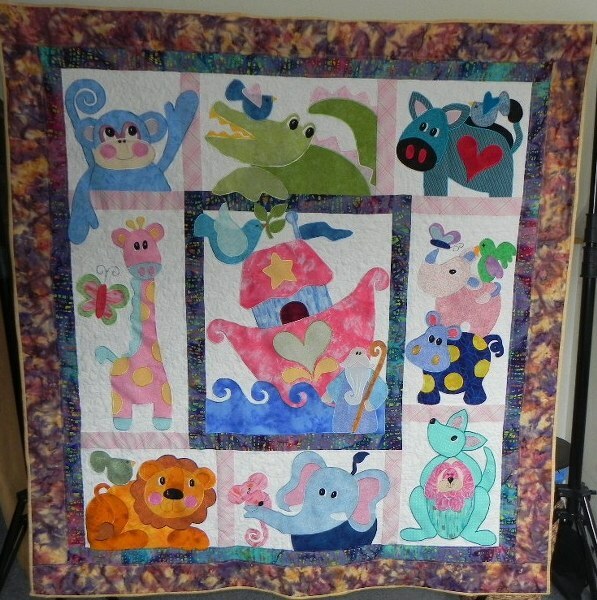 Anyway, to cut a long story short, I will not be using my Noah’s Ark quilt as a doormat. 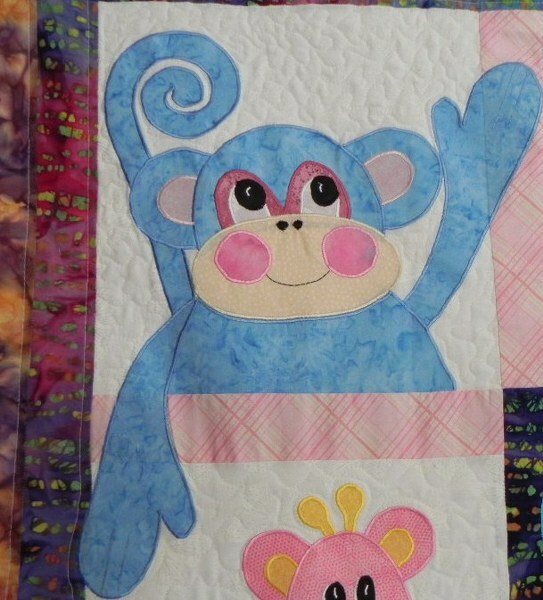 I have taken it apart though and will be re- quilting it. The replacement track for my quilting frame has just arrived and I am letting it reach room temperature before installing it. That way, hopefully it won’t crack. 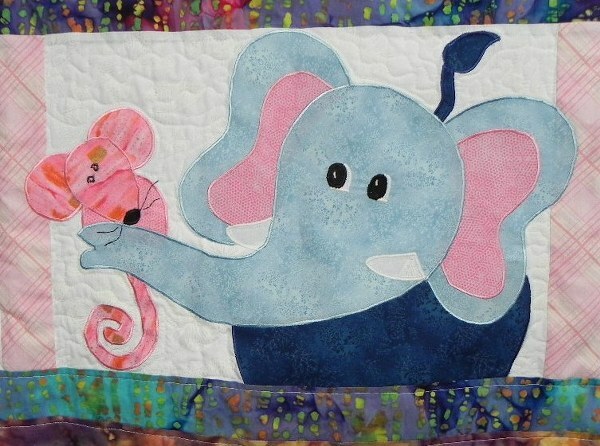 I am still getting advice from various quarters about the standard of quilting and am hoping the new track will help. Everybody is being very helpful so hopefully we will get there. Meanwhile perhaps you would like to admire my latest creation. I thought it was a bit mediocre before I quilted it but I think it has come up rather well. 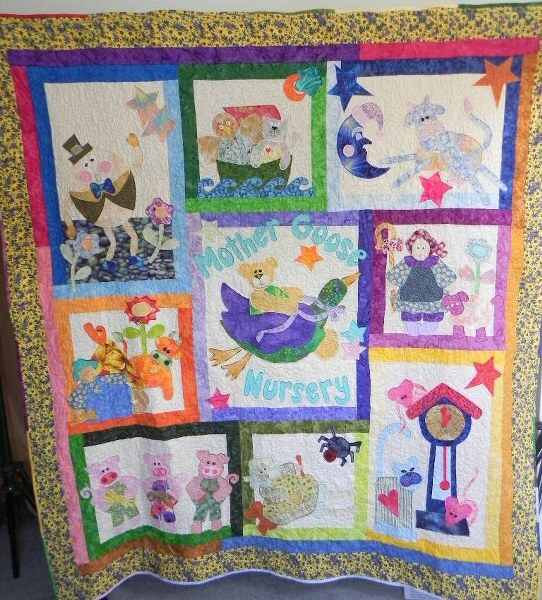 The quilting had defined it rather like the backstitch on a cross stitch picture. 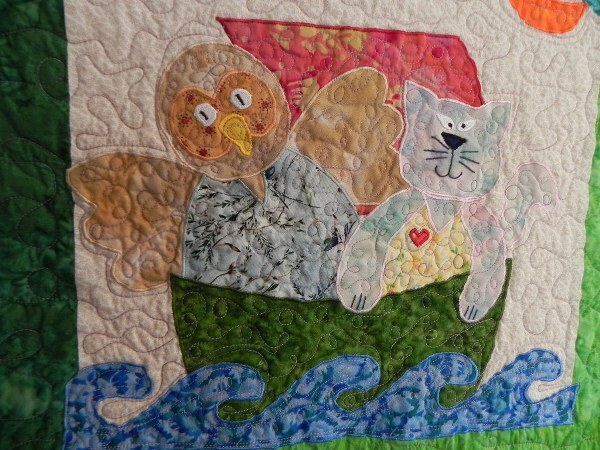 I am hoping my next quilt will be better but crossing ones fingers and manoeuvering the carriage on the frame are not compatible so let’s hope luck doesn’t come into it. 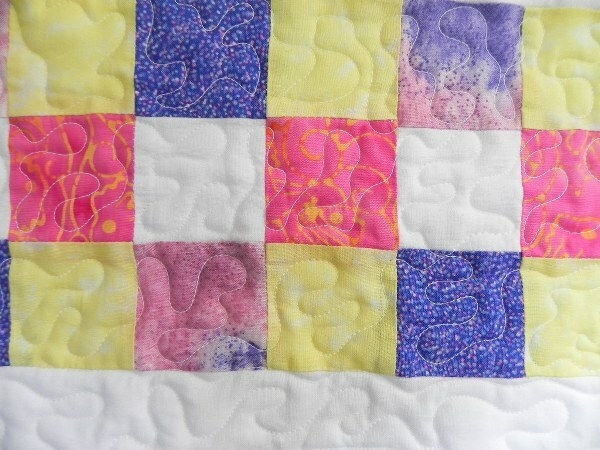 I tried to do a pastel quilt but I am afraid this is the nearest I could get using my stash. I just don’t seem to do pastels. I now have much more fabric and so could probably do a paler version but it wouldn’t be me somehow. Anyway, apparently vibrant colurs are better for babies so that is my excuse. 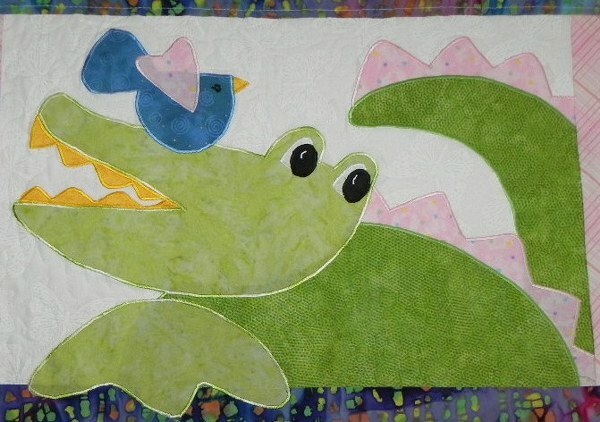 I have spent the day packing panels and fat quarters for the Spring Quilt festival at Westpoint in Exeter. If you are in the area pop in. I wager you won’t be disappointed. 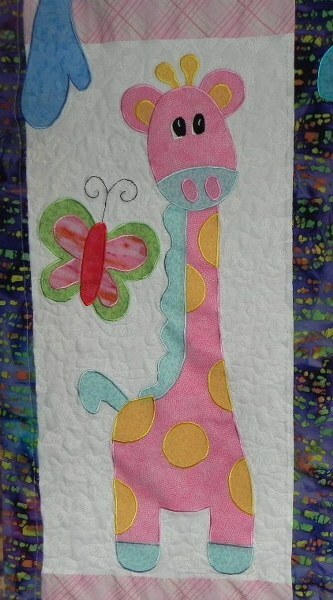 I finished the first quilt with my new machine,stitch regulator,carrriage combo. Am I happy? Nope. I can see no reason why I won’t get all the problems smoothed out and look back on the early times as a learning experience, at the moment though I am not a happy bunny. I finished one of my favourite tops and thought it was ok until I looked closely then I found that I obviously haven’t got the hang of the setup. Happily, for the purposes of this blog you can’t see what I can see cos it is mostly on the back. I haven’t decided whether I want to unpick it all and redo it or even if that is possible at this point. However, you can pretend it is perfect and enjoy the result. I haven’t got a dog which is a shame because I gather that the dog’s basket is where all the failures go. It will probably end up gracing the floor when members of the small people class visit. Mind you it won’t get much wear under those circumstances. I don’t think that has ever happened now I come to think of it. I wonder what it would look like as a door mat. It is a similar one to a top I showed you in July 2011. It is just different fabrics, same pattern. When you pay the price I did for the pattern(s) you make a few. It is by Kookaburra Cottage and I kept fairly closely to the original colours as I liked them. Crocodile. Does it look to you as if he’s going to do the peanut tossing trick with a feathered substitute? Monkey. I love the way he oozes into the other frame. Zebra, believe it or not with perhaps a Tick Bird. I’m just an old romantic. Someone commented that my zebra didn’t look like one so I tried again. Well what did you expect. Black and white is so passé. Blue is the new black – or is it white. 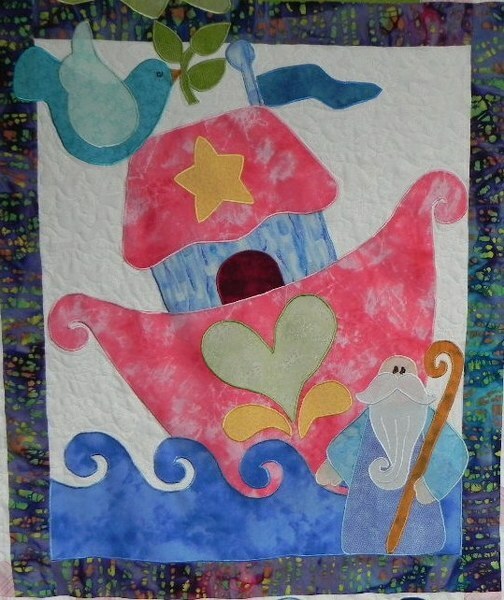 The Ark and the Dove of Peace. Looks like the sea is a bit choppyand I’m not sure why Noah is walking on water. He could get his socks wet. 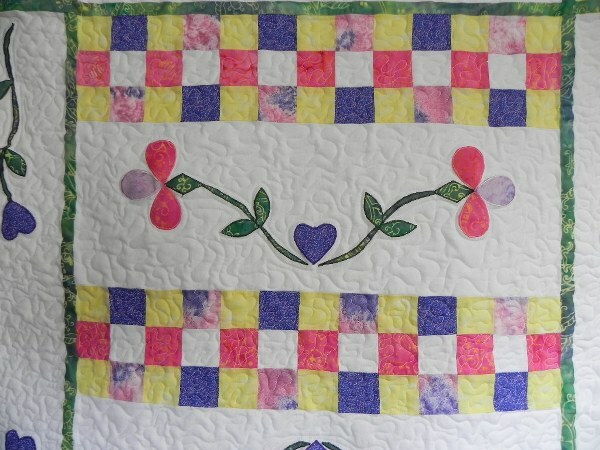 I did this as per the pattern but I wandered into the The Cotton Patch one day -not an easy feat when you live as far away as I do- and saw this fabric which I used in the next one. Much more authentic, I think you will agree. I have just spotted the potential for a bit of free motion on the background fabric. 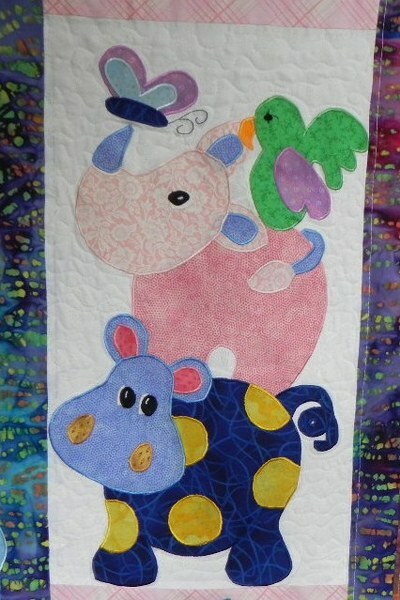 Hippo and Rhino with Parrot and Butterfly. Lion and Friend. I’ve seen a lion close-up on a kill in the wild and I can tell you, even full of food they are not that friendly. Elephant and Mouse. What’s to say – such a cliche. 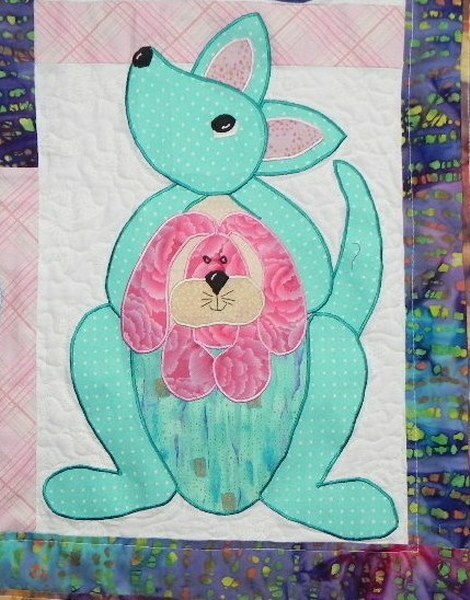 Kangaroo and Rabbit. That relationship has me a bit bemused. Should have gone to Specsavers. (You might have to live in the UK to get that reference). Is it my imagination or are fabrics not as interesting as they used to be. I suppose it could be that as it is now expensive companies are playing safe and not risking printing fabrics that might be too different. Unfortunately I am totally incapable of using dull colours. Apparently this is unusual among those that live in grey countries. (Daughter number one did her degree dissertation on the subject). I blame it on my exposure to Australian patterns whilst escaping from Papua New Guinea for short sortés and retail therapy. To be honest PNG has the potential to be sunny if only it didn’t rain so much. Stop Press! I have had email exchanges about the stitch quality of my set up and I think that I have the answer. Basically I can sort out the looping problem but my expectations are too high. ‘C’est la vie ‘ as our Gallic cousins are wont to say. 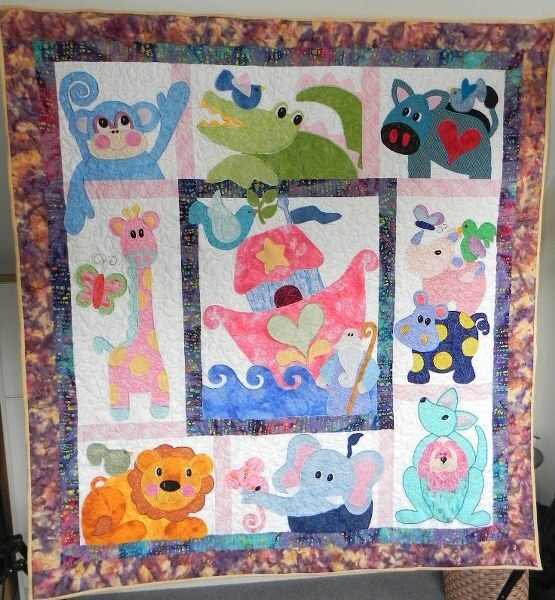 It still beats anything I could do with free motion quilting off the frame. In fact I don’t know how anyone does that. I could go back to stitch- in- the- ditch but it kills my shoulders and it’s a real pain trying to keep ‘in the ditch’ so to speak even with all the fancy gadgets I have purchased over the years. I have discovered that having my original ‘frame machine’ available off the frame with the purchase of the new one, I now have the facility to do echo quilting with a large throat machine. This helps somewhat if I could only keep the stitches straight. The pile of OFOs has to diminish so watch me go.